Powder vitamin B from compounding pharmacy (B1, B2, B5, B6, B12, FA). Powder Coenzyme Q10 from compounding pharmacy. Glutagenics by Metagenics – main ingredient glutamine, an amino acid. Garden & Orchard Blend Juice Plus. Springboard FloraBoost Probiotic for Kids. L’il Critters Gummy Vites Complete. 1. Probiotic – FloraBoost is an excellent probiotic that Jake cannot live without. Last week I was out of it for four days and was going to wait until my follow-up appointment this week to pick up more. After just a couple of days without it, the eczema on his foot started to come back in the predictable places. I called my husband and told him to go pick up some on his lunch break asap! There are many probiotics out there, but quality really is essential. A good probiotic will have at least 5 billion units with 4-5 strains. 3. 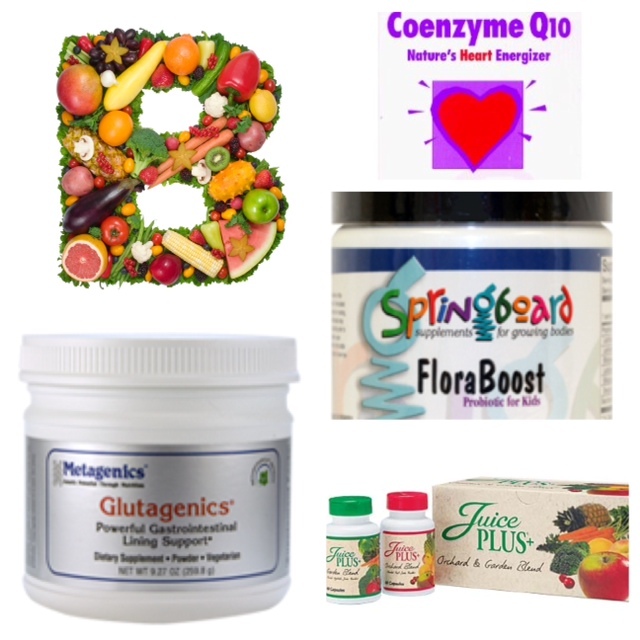 B vitamins – This is a prescription from the compounding pharmacy that is specially mixed to meet Jake’s nutritional needs. B vitamins are beneficial for the health of nerves, brain function, skin, eyes, hair, liver, mouth, and for maintaining healthy muscle tone in the GI tract. 4. Coenzyme Q10 – Another prescription from the compounding pharmacy. CoQ10 as it is commonly called, is an antioxidant that is necessary for the proper function of many organs and chemical reactions in the body. 5. Juice Plus – Jake started taking Juice Plus in May of 2011 when he was 2.8 years old. I initially put him on it because he had been so sick with ear infections, fevers, colds, and asthma. I am proud (and a little surprised) to report that this coming up May will be two years since he has had a problem with any of these things. He got a stomach bug last January, but that is it! Zero doctor visits. When I first put all of these supplements on my countertop back in September, I remember thinking, Wow! That’s a lot! Now, it doesn’t seem like a big deal. The first week or two was the most challenging. Books that I had read prior to starting this process said that at first kids put up a fight, but then they end up loving their vitamins. That first week, I had my doubts, but now he loves his vitamins and will not let me forget about them. The glutamine and probiotic goes into his applesauce each morning at breakfast. I mix the B and CoQ10 into about two tablespoons of apple juice when he is done with breakfast. “Prescription for Nutritional Healing” – Fourth Edition, by Phyllis A. Balch, CNC. “The Autism Revolution,” by Dr. Martha Herbert, Harvard Health Publications, 2012. Disclaimer: All data and information provided on this site is for informational purposes only. Supplement statements have not been evaluated by the FDA. These products are not intended to diagnose, treat, cure, or prevent any disease or disorder. This supplement program was designed to meet my child’s specific nutritional deficiencies. Always consult with a doctor before beginning any diet or supplement program.